Pictures from our 2014-2015 Roosevelt Art Show. Thank you to family and friends who helped put the show together, to the Media Specialist for hosting a fabulous book sale, and to the PTA for coordinating a wonderful ice cream social. I hope everyone got a chance to come out to see all the art and appreciate their child's creative talents! 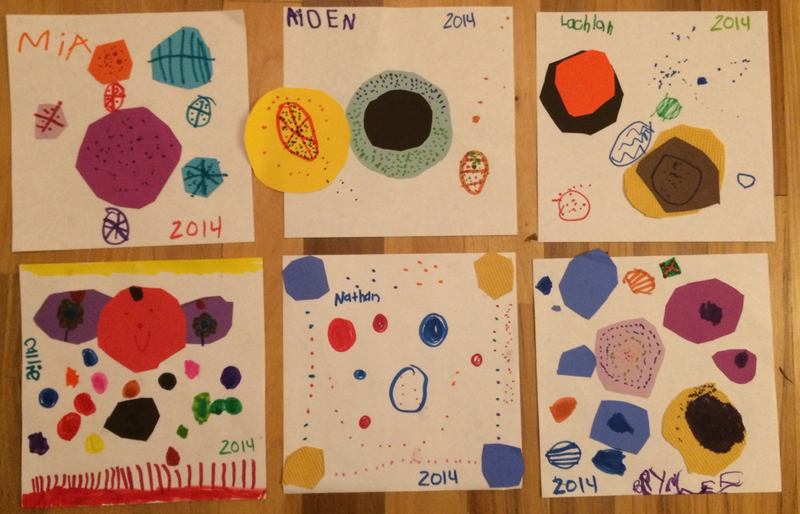 Clay for Kindergarten is very much experimental. 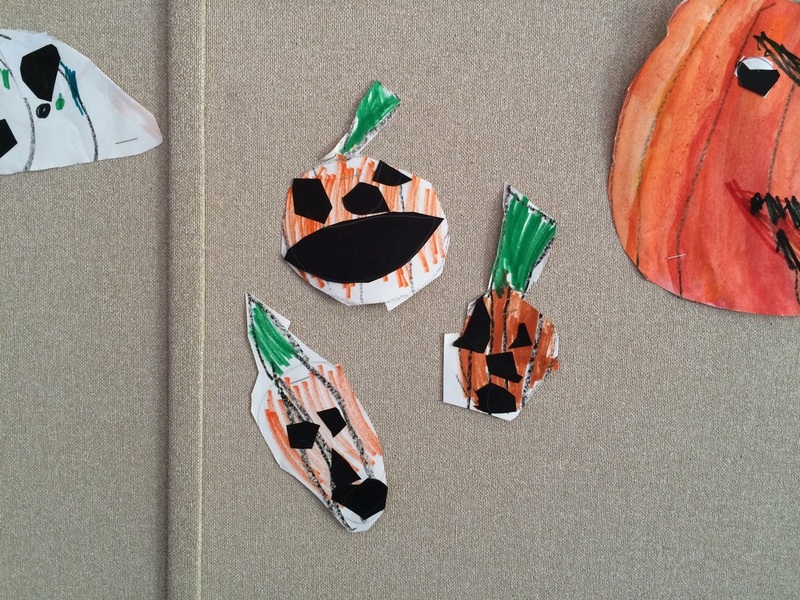 They are working on filling up space and their fine motor skills with both of these projects. The first project was a texture pendant. Each child got a lump of clay that they then split and rolled into two balls. They then flattened the pieces of clay with their hand (not too thin!!) 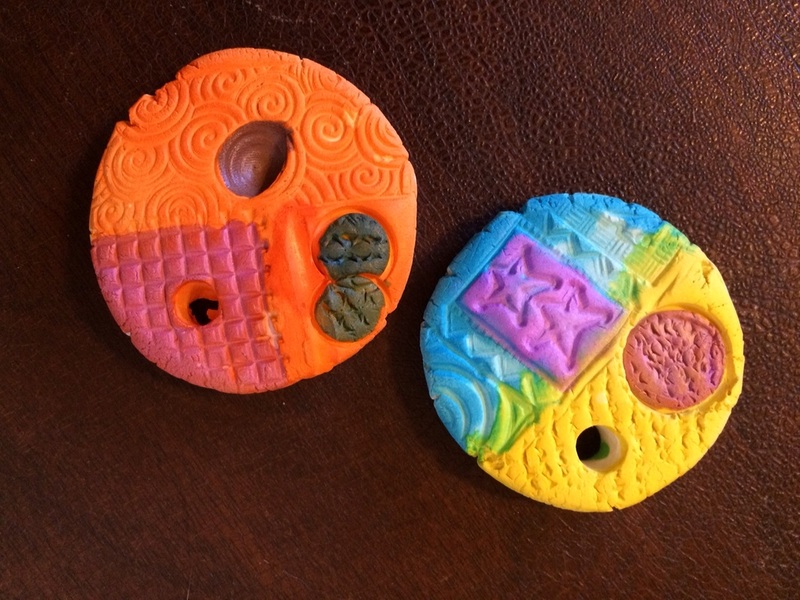 and used found objects and stamps to create a design on the pendants. When they were finished with both, the brought them to me so I could put their name on them and poke a hole for a string. 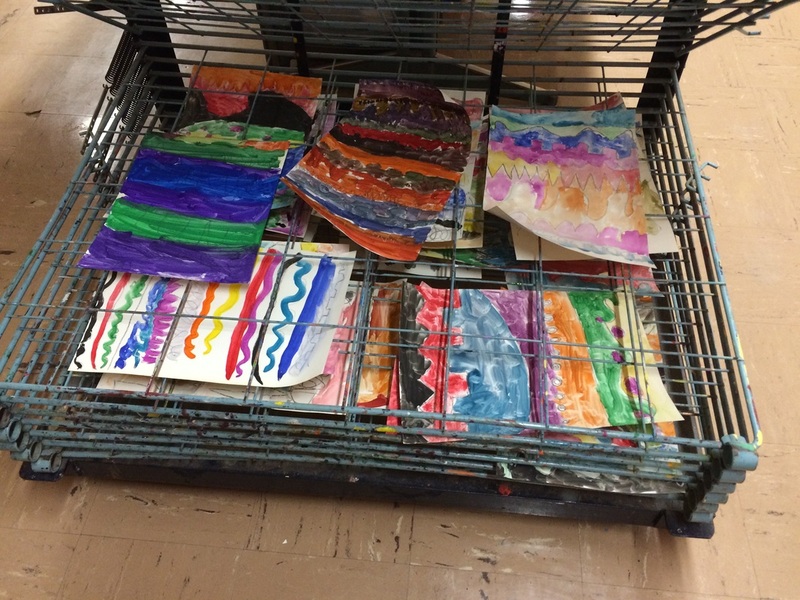 Once they were dried and fired, we used liquid watercolors to paint them and layer the colors. These turned out simply beautiful! 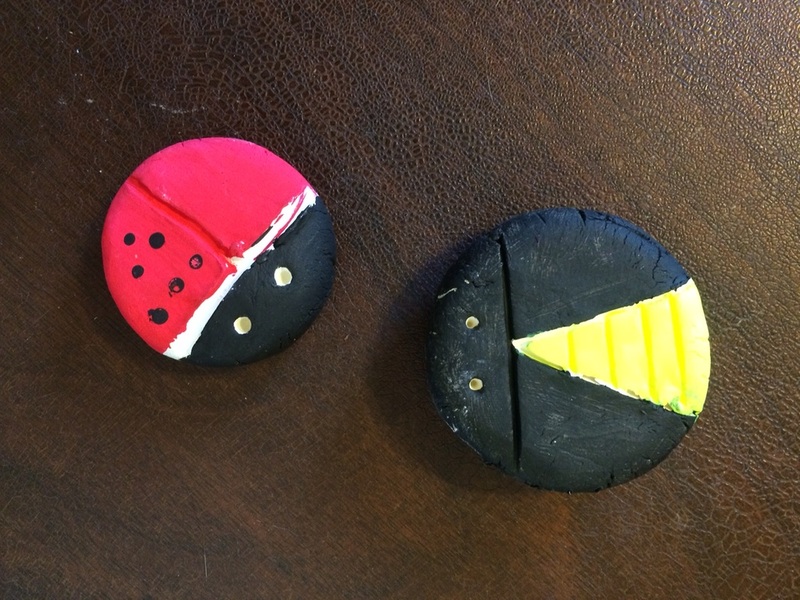 Below are my two samples, I forgot to photograph that day and the students very much wanted to take them home! For our second project, we once again flattened a ball of clay. Once it was flat, the students had to chose to do either a lady bug or a lightening bug. Then working step by step, each group worked on drawing in their details with different objects. 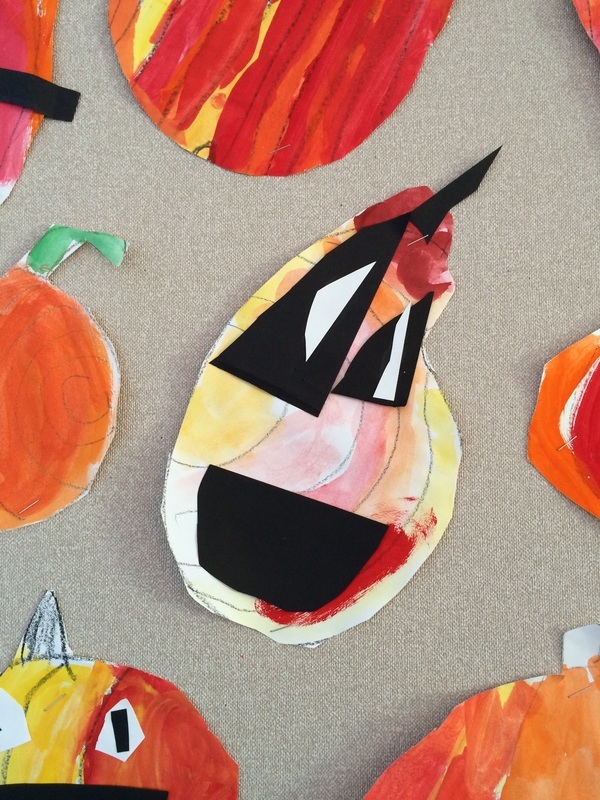 Once they were dry and fired, we used tempera to paint them and then created a leaf for the bug to sit on! 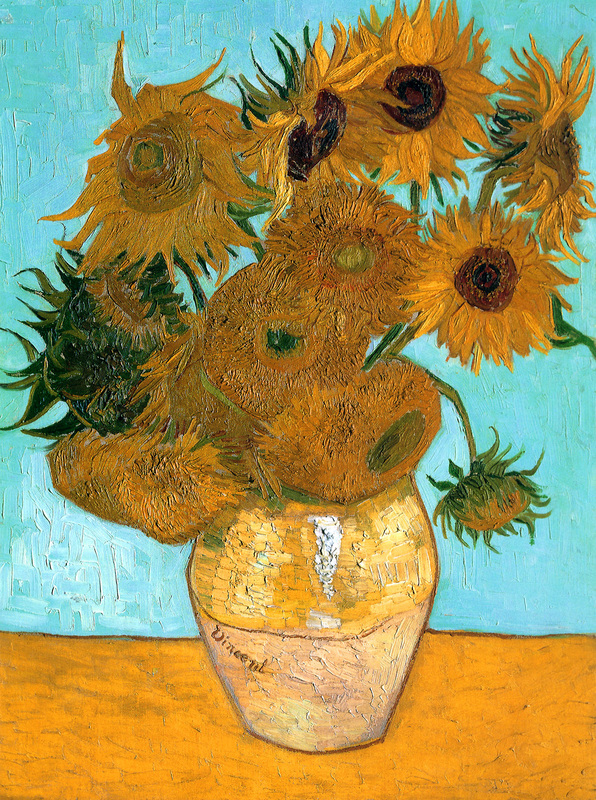 We started this project by looking at a famous painting by Van Gogh, "Vase with Twelve Sunflowers". 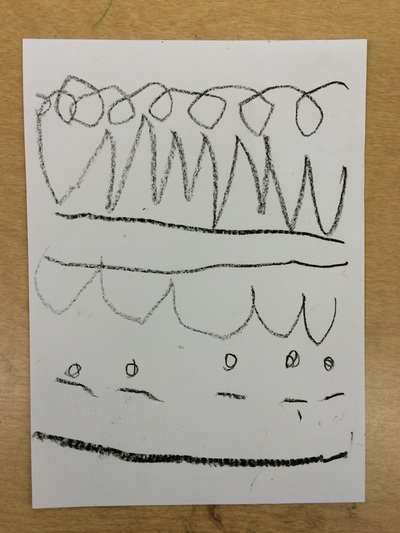 We talked about what colors we saw and what type of flowers they were. I then talked to the about different types of pictures; portraiture, landscape, still life, etc. We looked at a few other pictures and they guessed what type of picture it was. They did a very good job! 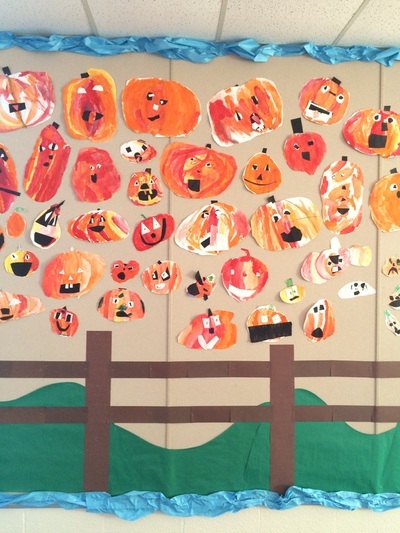 It took us four classes to do our own pictures of sunflowers. The first day we did the table that the vase sat on and we made a checker board pattern. The second day we made our vase and painted the background. 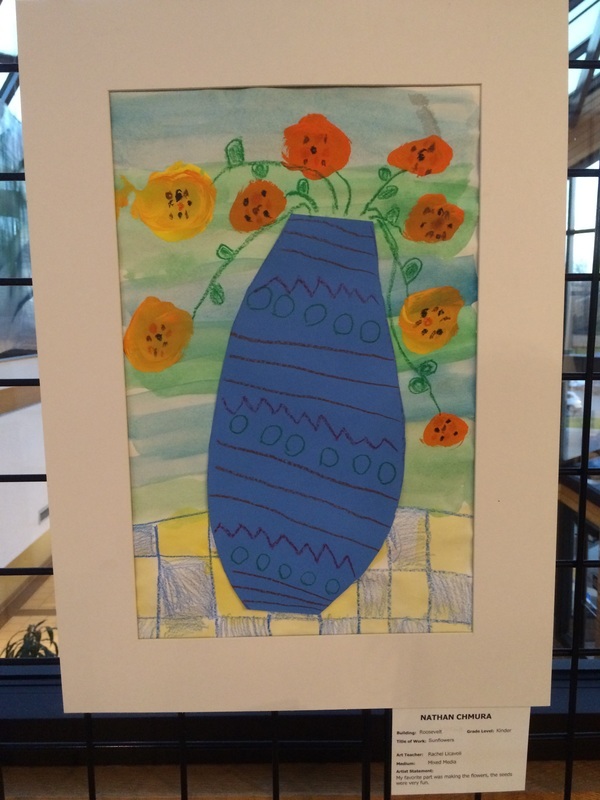 The third day we glued our vase on the paper and using yellow and orange tempera paint, we painted our sunflowers. 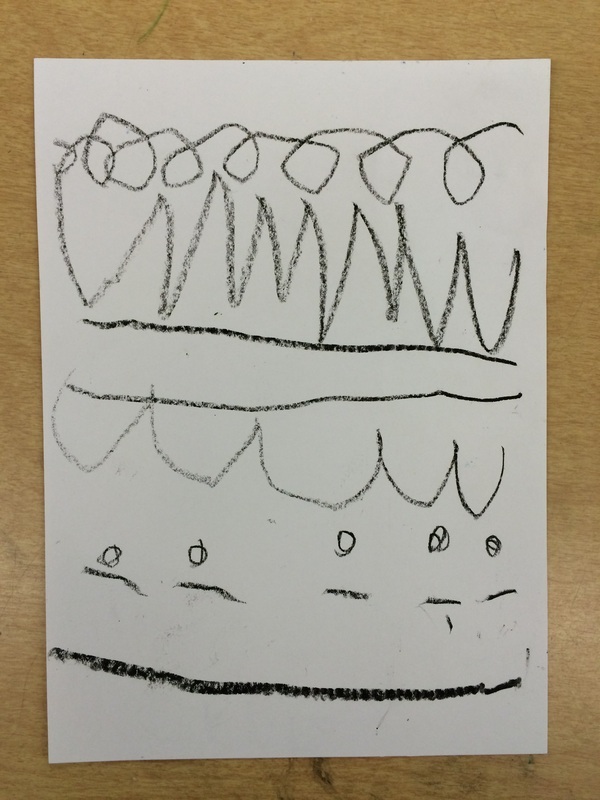 The last day we used oil pastels to create stems and seeds for our sunflowers. The students were challeneged each day with recalling the type of picture we were making the name of the artist. 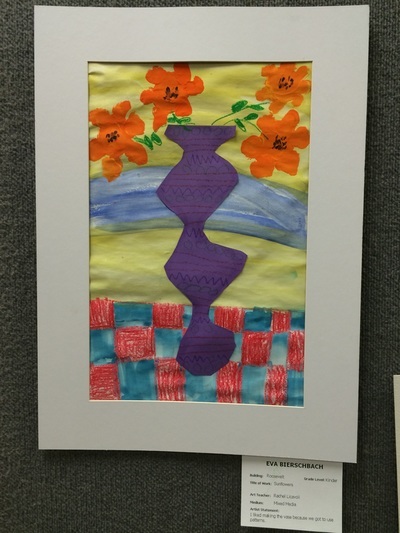 Congratulations to all the students who had work up at the Fine Arts Festival this year at the Livonia Civic Library! 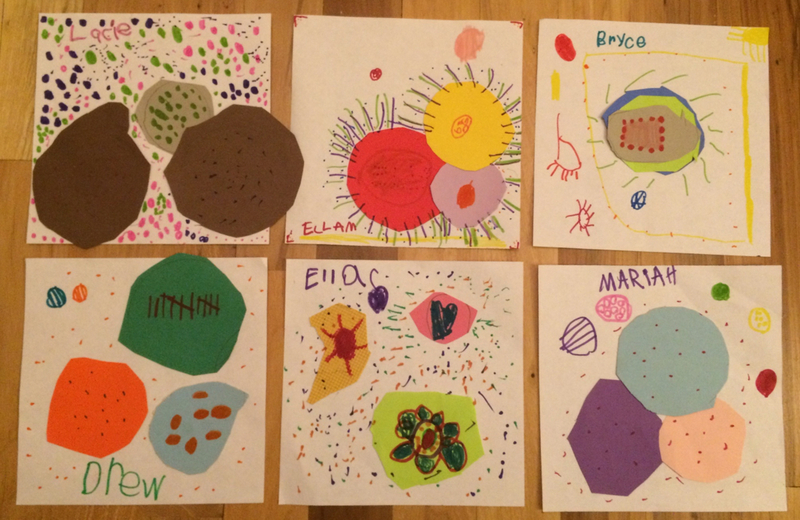 Here are all the student work from Roosevelt and Johnson. Way to go everyone! 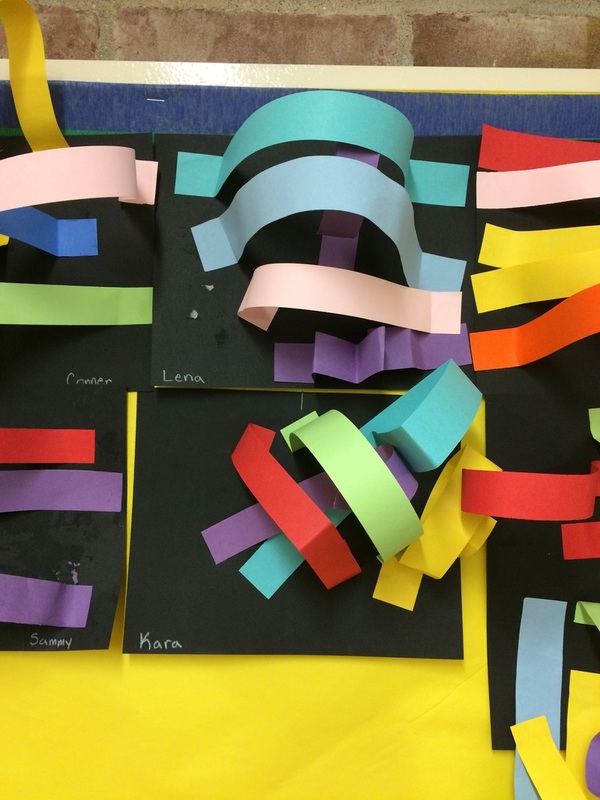 To round out our experiments with line, we created some 3 dimensional lines out of paper strips. 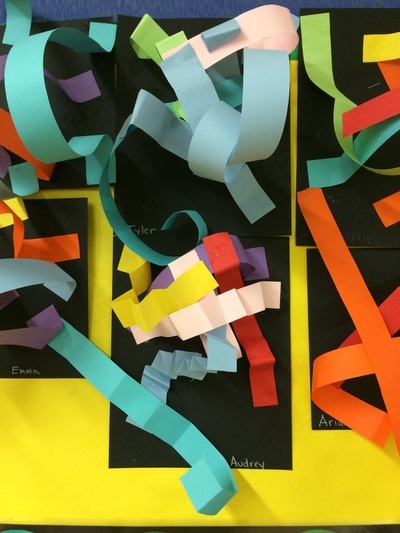 Students were shown how to create curved/arced, wavy, curly, angular, and zig zag lines out of paper first. Then they were tasked with creating at least 4 lines on their own. 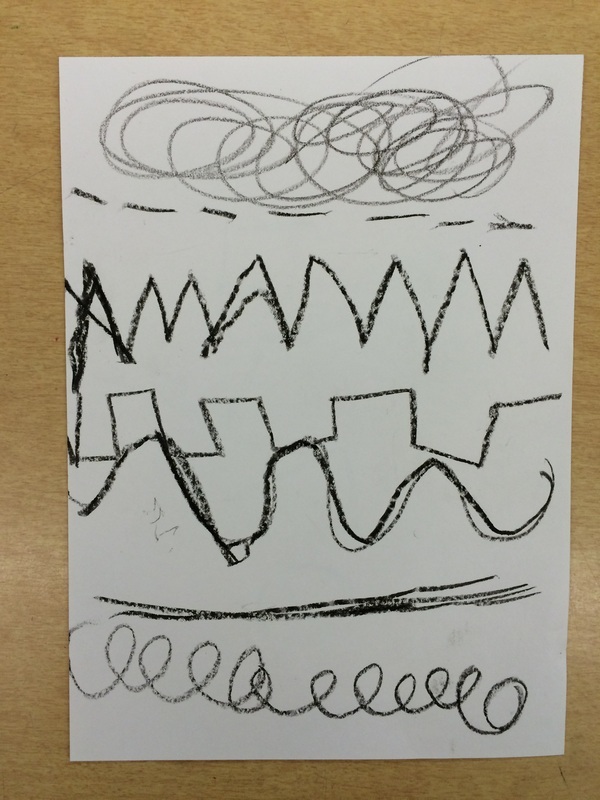 Some students discovered new ways of making lines as well! I had a few adding strips together to make BIG lines, and other connected curly lines together or zig zag lines together to make new, interesting lines. It was a very fun experiment and the students were very proud of their work. 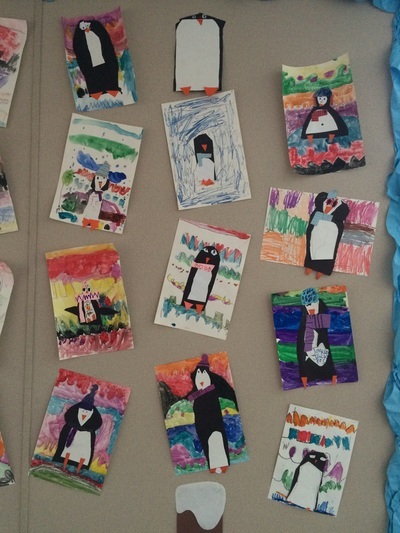 Kindergarten students used basic shapes and different papers to create a penguin to go on top of their painted line picture. This took us a few days, but once the penguins were made, the students added their own unique details to help keep the penguins warm and looking cool! 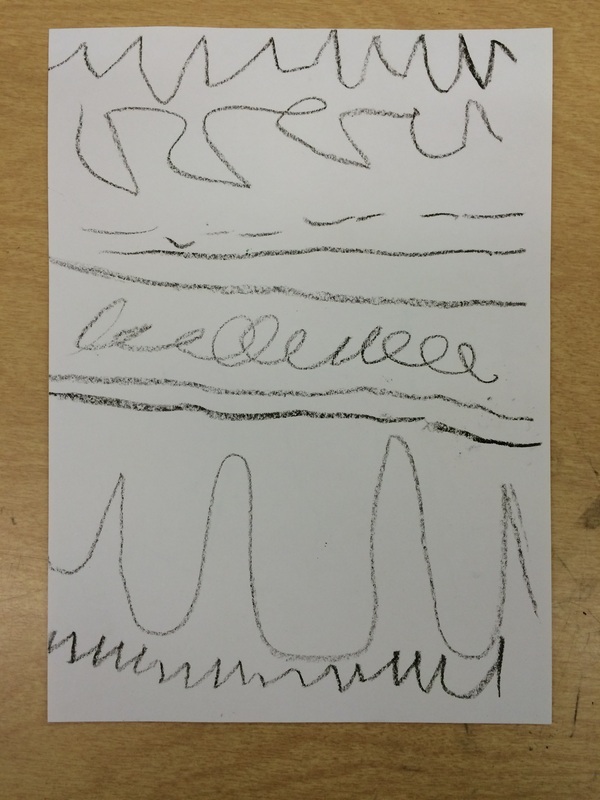 As a class, we discussed and made a chart of different types of lines. 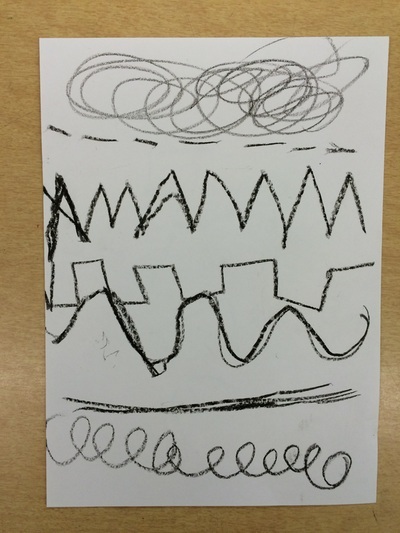 Lines like wavy, curved, zig-zag and many more. 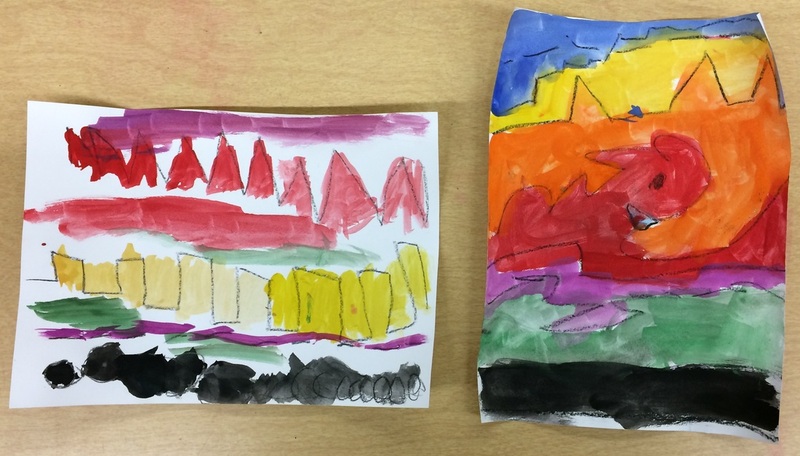 Students then used a big crayon to practice some lines on a piece of paper. 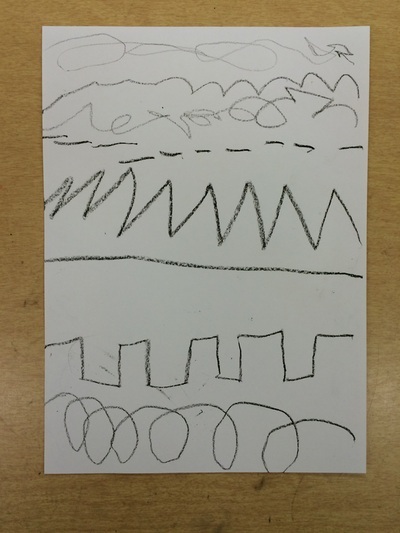 They could use as many lines as they wanted, but the lines had to go from one side of their paper to the other. 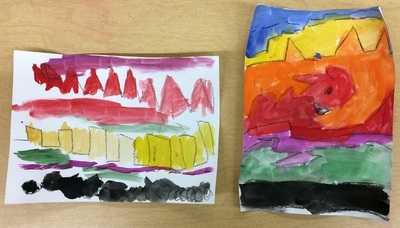 The next Art day, we used tempera paint to color in between the lines. 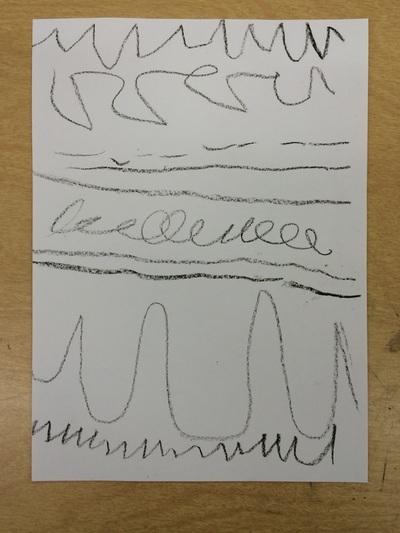 This helped students practice brush control. 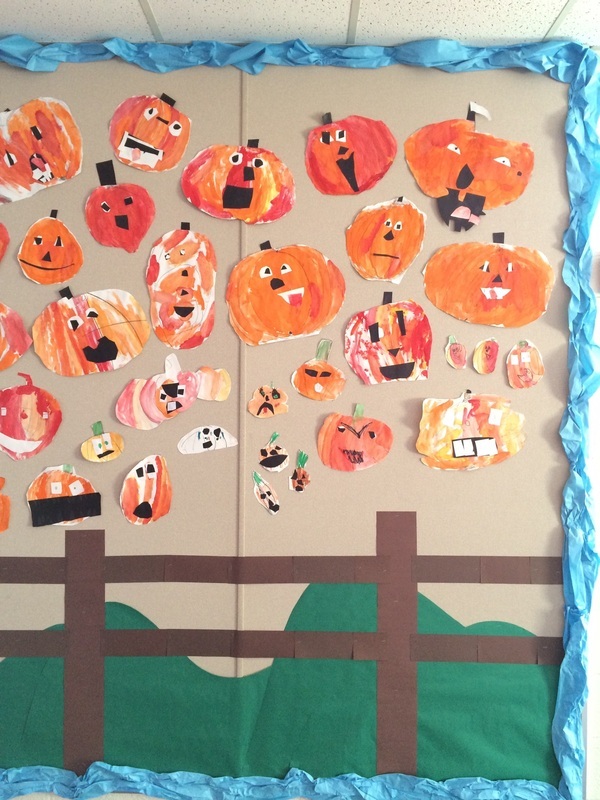 I was very impressed with how some of these came out! Kindergartners started these pumpkins way back before Square 1, but had to be put to the side for a few days. Students learned a little bit about pumpkins and how they grow in sections. 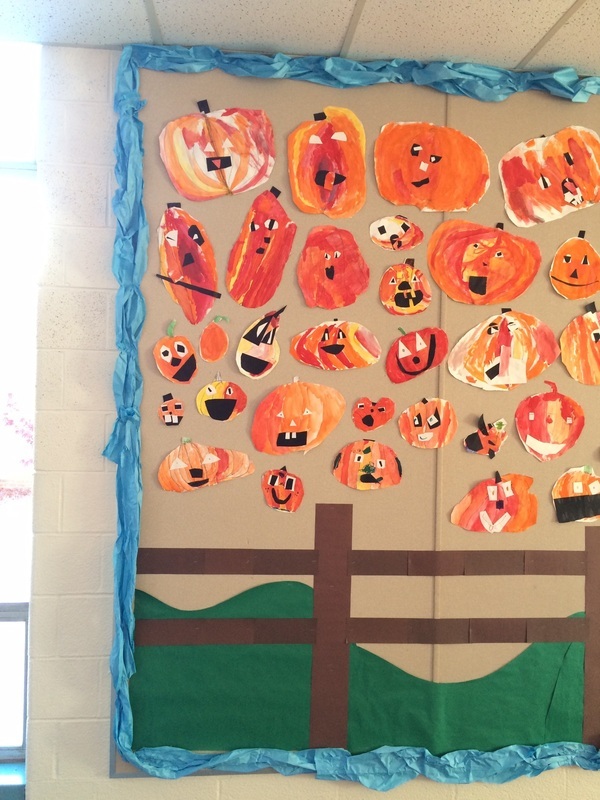 We drew our pumpkins and painted our pumpkins one section at a time. Students found out that when you mix red and yellow, you can create a whole new orange! 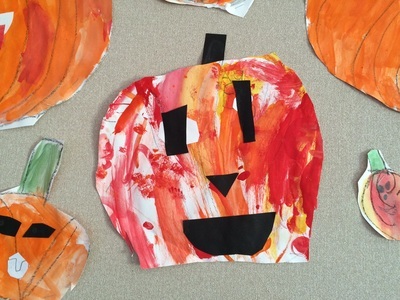 Focusing on using those three colors, students blended and painted their pumpkins. 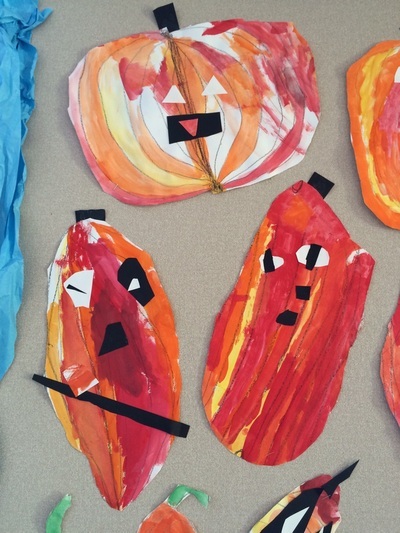 Once dry, we used collage materials (paper, scissors, glue) to create expressive faces for our pumpkins! 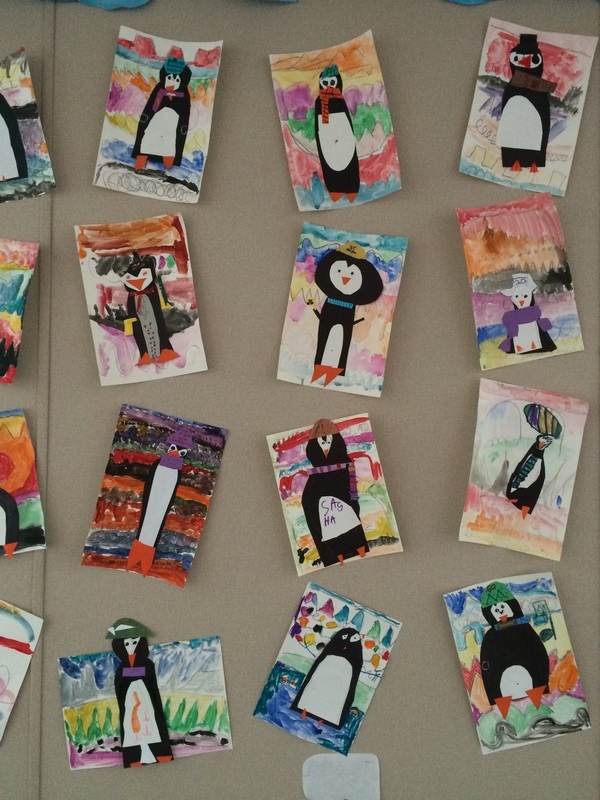 We finished them just in time for Parent/Teacher conferences. 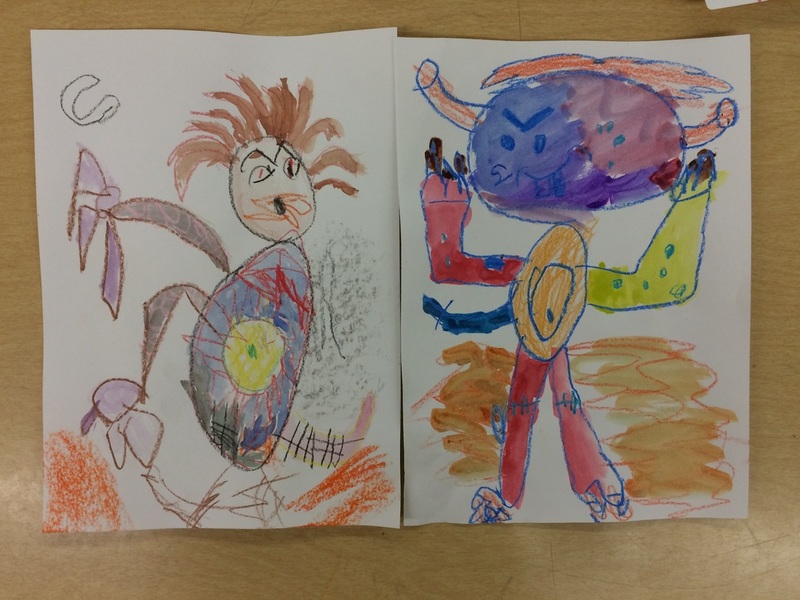 If you did not get a chance to see these wonderfully expressive creations in person, take a look below! Students are currently working on special projects in the art room for our annual Art Fundraiser. Your child's artwork will be submitted to Square One Art Company. 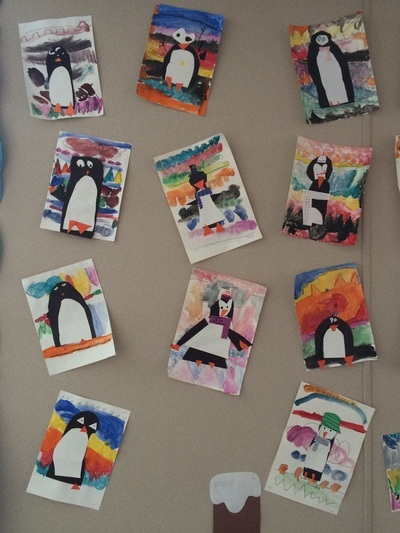 Each student will receive a personalized order packet along with a set of free stickers featuring their own masterpiece from Square One. These order forms will come home mid November. This would be a great opportunity to order personalized gifts for family and friends in time for the holidays! The order forms will be due by the end of November so that orders can be shipped to Roosevelt before our holiday break! Orders can also be made online for your convenience. 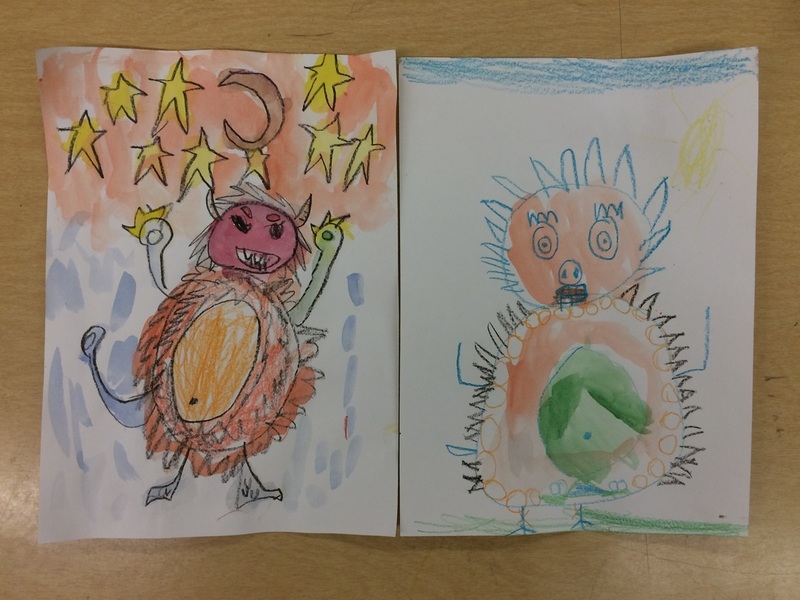 Please help support our art program and help make your holiday gift giving easier! 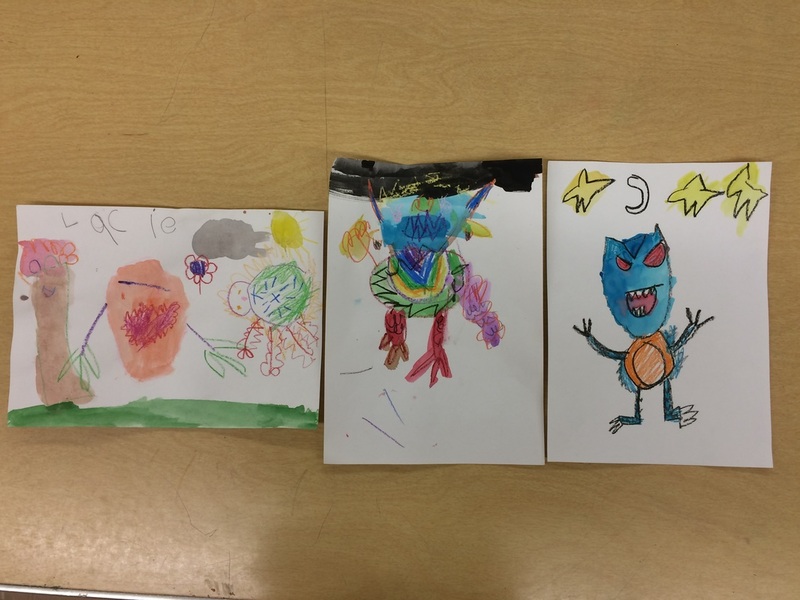 Kindergartners just finished making a second dot picture (they received so many compliments on the first and I thought they would look fantastic on a coffee mug!). They worked especially hard on this project and they turned out even better than the first! You can see some examples below.